While I always welcome the chance to try a new electric car, first drives are often disappointingly brief. Unfortunately that’s exactly the case with Ford’s Focus Electric, a new competitor for Nissan’s Leaf that I’ve been hoping to try out for a while. As a result, my time with the Focus EV is limited to about half an hour, and my choice of road narrowed to just one: a tight and twisting ribbon of tarmac at the Millbrook proving ground in Bedfordshire. Dubbed the city route, it’s a mile-long loop stuffed with short straights, tight corners and stop lines, plus the odd speed bump. And as a simulation of real life it’s roughly as convincing as Coronation Street. The route is better than a real road in one respect: there’s the guaranteed absence of patrol cars and speed cameras. That means there is just enough wiggle room to confirm that the electric Focus feels about as lively as the Leaf. Firmly prod the accelerator and the Focus gathers pace with surprising vim, to the tune of a rising, science-fiction whine from under the bonnet. Given a longer straight, the Ford would beat the Leaf to 62mph by half a second, at 11 seconds dead. It does so via brute force, however, employing a 107kW electric motor versus the Nissan’s 80kW unit. The gap would be bigger if the Focus hadn’t scoffed so many pies, carrying around an extra 160kg or so over the Leaf’s kerb weight. The Focus Electric is as quiet and refined as you’d expect of an EV, and it handles rather better than most. There’s plenty of grip, neatly curtailed roll in corners, and a very pleasant suppleness over lumps and bumps. The steering, electrically assisted of course, has a nicely judged weight to it and is much more informative than the Nissan equivalent. Braking feels reassuringly firm and entirely normal. 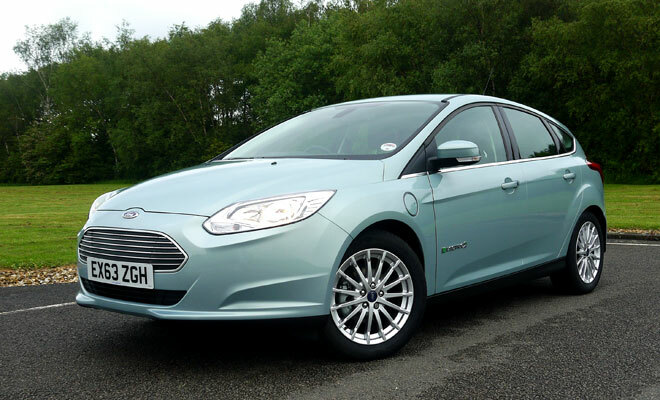 With feet off both pedals, the Focus Electric does a fine job of mimicking engine braking. As far as I could tell there’s no way to call up a lower or higher level of energy recuperation, as there is in many other electric cars. 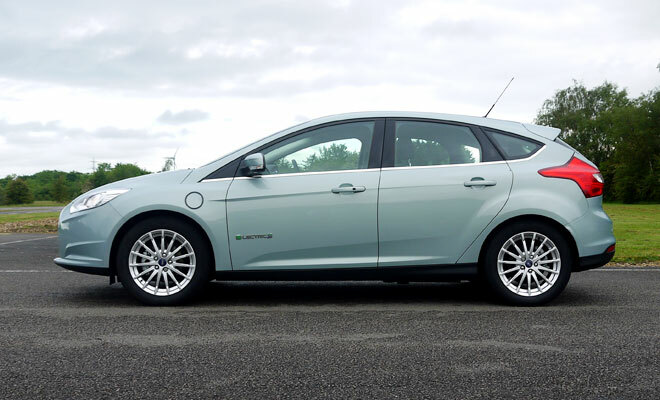 From a standstill, the Focus EV mimics a fossil-fuelled car with an automatic gearbox, gently creeping forward unless held in check on the brake. 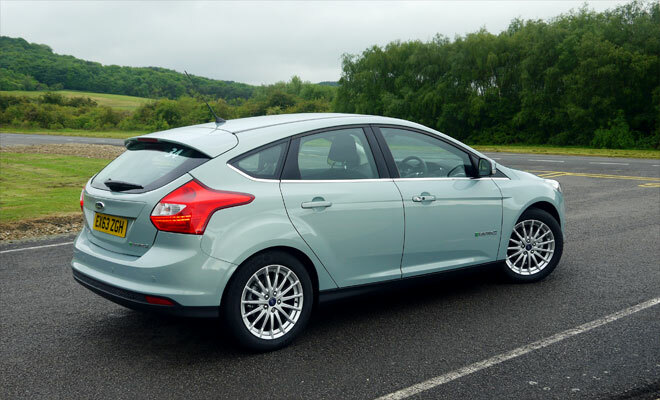 Outwardly, there’s little to mark the Focus Electric out from its conventional brethren. 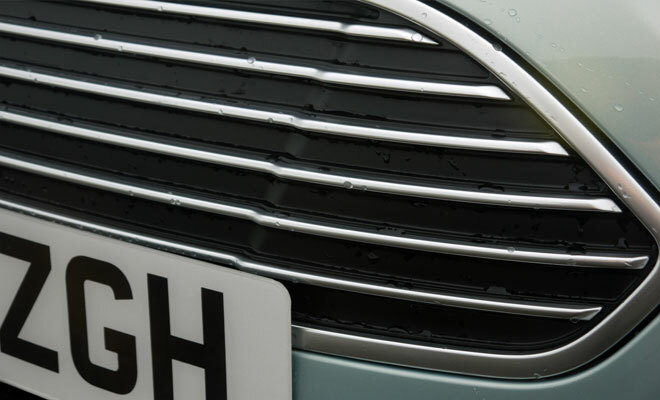 The wide-mouthed front grille is entirely blanked out with black plastic, there’s a charging flap on the nearside front wing, and absence of the usual filler flap under the offside rear lamp cluster, plus big silvery badges at the back and on either side. The result is much more handsome than the ugly duckling Leaf, but also much more anonymous among millions of other similarly styled Fords. One of the Focus’s less clever modifications becomes obvious the moment you lift the tailgate. A big hump between the rear suspension turrets swallows up about 80 litres of the Ford’s boot, leaving 237 for your luggage. The lift-up boot floor, level with the top of the hump, seems disconcertingly high off the ground as a result. Earlier examples of the Leaf, built in Japan, had a similar protuberance in the boot. As with the Ford, the bulky rear box was needed to house chunky pieces of high-voltage hardware, responsible for supervising the flow of energy to and from the battery. More recent British-built examples of the Leaf, updated in various ways, benefit from smaller lumps of hardware that have been squeezed under the bonnet, yielding a rear end free of unexpected bulges. 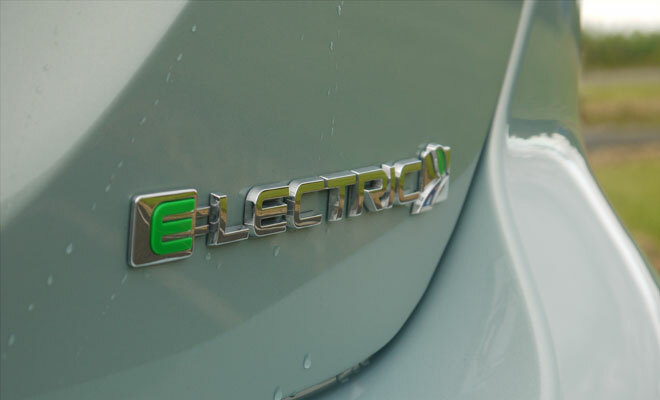 Leaf and Focus boast about the same battery capacity – 23kWh in Ford’s case and 24kWh for the Nissan. Ford’s battery is tucked away under the rear seat and above the rear axle, while the Nissan’s battery is flatter, wider and mounted further forward, running under the front and rear seats as well as beneath the raised rear footwells. When it comes to packing in all the required pieces of hardware, Leaf trumps Focus comprehensively. Both cars employ a lithium-ion battery chemistry but the Ford package is more sophisticated, with liquid heating and cooling of the pack to help ensure long life and durability. The Leaf’s battery, by contrast, is passively air-cooled, though it’s too early to say if this less complex design will prompt many early failures. In the relatively mild temperatures of the UK, the benefits of active temperature control may well be negligible – or at least that’s the argument put forward by Nissan. On the important question of range, the Focus will probably be the first of the pair to fall short. Its official NEDC range is 100 miles, while the Leaf manages 124. My fully charged Focus itself predicted just 64 miles of range on startup, presumably based on the driving styles of previous occupants. 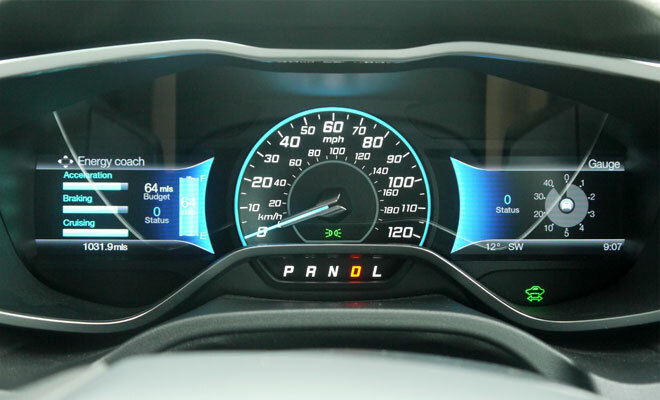 The instrument panel fitted to the Focus Electric is clear and simple, with twin digital screens laid out either side of a central analogue speedo. Information on the screens can be configured to provide various forms of feedback on energy flows and even coaching to help improve your regenerative braking. And while careful Leaf drivers can grow little digital trees, attentive Focus pilots can release digital butterflies, apparently. 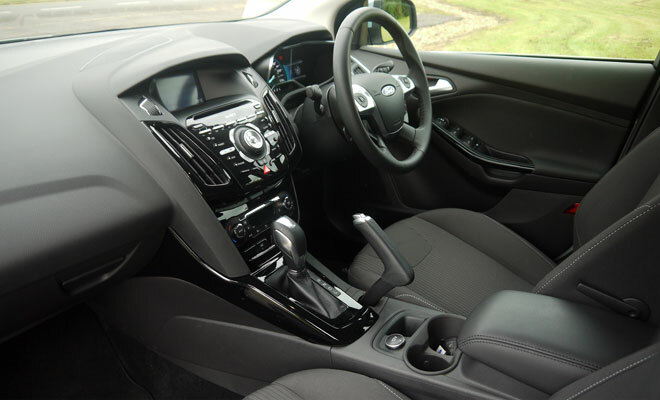 The rest of the Focus interior is fairly standard Ford, meaning a solid feel, reasonable quality, and more little buttons than a branch of Dixons. 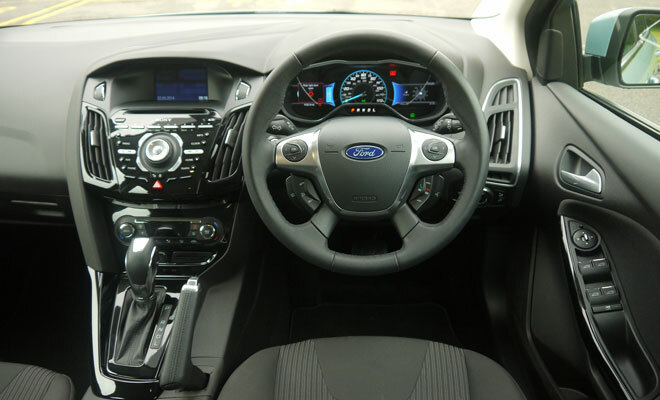 The standard feature count is high, including 17-inch alloys, automatic lights and wipers, a Sony DAB stereo with navigation and reversing camera, keyless entry, cruise control, climate control, and Ford Sync services including voice commands and emergency assistance. The standard price is a less inviting bundle, amounting to £28,580 – after the £5,000 helping hand from the Plug-in Car Grant. A top-of-the-range Nissan Leaf in Tekna trim, offering a similar gaggle of features plus the added bonus of leather upholstery, costs a noticeable £3,090 less. That price is the Focus Electric’s biggest hurdle. In a world where there are already plenty of reasons not to buy an electric car, a steep price is never going to trigger an avalanche of sales. I’ve heard suggestions that Ford expects to shift only about 30 examples in the first year of UK sales. Sadly, I suspect it might have to offer discounts to hit even that modest level of uptake.